Also visit www.csa-dixie.com/Liverpool_Dixie for a great site with loads of information about the critical role that England played in outfitting the Confederate States Navy -- including the acquisition of the CSS Shenandoah. Among other topics, it descibes the heroic efforts of Commander James Dunwoody Bulloch who served as naval purchasing officer employing ingenious tactics to work around England's official neutrality status. Personal History of Capt. James I. Waddell, C.S.N. The Confederate Navy was top heavy with Marylanders. Besides the two admirals, Maryland furnished one commodore, seven Captains, four commanders, seven lieutenants commanding and 15 lieutenants. There were 163 recorded Marylanders who would serve as officers in the relatively small Southern Provincial Navy. The majority of career men resigned from the old navy, but their resignations were not accepted. Instead, their names were stricken from the roll and marked as dismissed. One such Marylander was James Iredall Waddell. Captain James Iredall Waddell was born in Pittsboro, North Carolina, in 1824 and was appointed to Annapolis on September 10, 1841. After graduating, he was assigned to duty on the U.S. ship, Pennsylvania. A few months later at Portsmouth, Virginia, he was shot in the hip during a duel with another midshipman and the injury caused him to limp the rest of his life. In 1858 he was promoted to lieutenant and made an assistant professor of navigation at the Naval Academy. In 1859 he was ordered to the East India Squadron and, after learning that the war had begun in 1861, mailed his resignation from St. Helena. Returning to Annapolis, he married his betrothed, Miss Inglehart, the daughter of James Inglehart, whose family was very strongly inclined to the South. The marriage took place in December of 1861 and he was listed on the Naval Registrar as being dismissed from service on January 19, 1862. After remaining in Annapolis for a short time, he rode the blockade to Richmond in February of 1862 and enlisted in the Confederate Army, receiving a commission of 1st lieutenant dated March 27,1862. Waddell was sent to New Orleans for a short period and then returned to Virginia to Drewry's Bluff as an ordnance officer. He was ordered to Charleston Harbor for a short while and then to Europe for foreign service, arriving in England in May of 1863. The Confederate Naval Department purchased a British merchant steamer, the Sea King, and in October of 1864, rendezvousing off Liverpool, she was commissioned the C.S.S. Shenandoah and was commanded by Waddell. This was the last of the Confederate cruisers and, with the exception of the Alabama, inflicted the largest amount of injury upon the U.S. commerce vessels during the war. The Shenandoah wiped out most of the New Bedford whaling fleet off Alaska, taking many prizes and more than 1,000 prisoners. At one time, her decks and cabins were so crowded that she was forced to place her captives in whaling boats and tow them through the Arctic Sea. From prizes taken on June 23, 1865, Waddell read accounts in the newspapers of the April proceedings between Grant and Lee relating to the surrender. The paper also informed him that the seat of the Confederate government had been moved from Richmond to Danville and President Davis had issued the proclamation giving assurance of the continuation of the struggle by the South. With this knowledge he had no right to suppose that the war had ended and so he continued his operations until August 2. On November 6, 1 865, he and his crew surrendered to the English government. Not until 1875 did Waddell leave England and return to this country. After re-establishing his home in Annapolis, the white-haired, limping sailor was once more called to the service of his nation. The governor of Maryland appointed him in the 1880s to take charge of the war that the state was waging against the Chesapeake Bay oyster pirates. After several days, Waddell's small force had completely wiped out the pirates. Upon his death in Annapolis, the legislature recessed its session for the day of his funeral. He died in 1886 and is buried in St. Anne's Cemetery in Annapolis, Maryland. 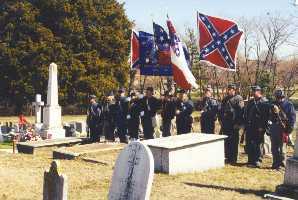 A large marble monument records a brief biography, a carved navy fouled anchor and the Confederate Battle Flag, which has a large star in the crossing. The last of the commerce-destroyers was the Sea King, or Shenandoah. This vessel was a full-rigged ship with auxiliary steam power, of seven hundred and ninety tons, built on the Clyde, and employed in the East India trade. She was a very fast ship, a twenty-four hours' run of three hundred and twenty miles being no uncommon thing with her. She cleared from London for Bombay October 8,1864, her Captain, Corbett, having a power of sale from the owner to dispose of her at any time within six months. She had on board a large supply of coal and provisions; but she was not altered or equipped for war purposes, and she carried no armament except two 12-pounders, which had been on board when she was originally purchased. On the same day, the steamer Laurel left Liverpool, having cleared for Nassau, with several Confederate naval officers, and a cargo of cases marked " machinery," but containing guns with their carriages and equipment. Making her way to Funchal, Madeira, she met the Shenandoah. The two vessels then proceeded to Desertas, a barren island in the neighborhood, where the Shenandoah received her armament and stores, and was transferred by Corbett to Captain Waddell, of the Confederate navy, her future commander. Waddell put her in commission, under the name of the Shenandoah, and she started on her cruise. The plan of the cruise of the Shenandoah was based upon the movements of the Pacific whaling fleet. A portion of this fleet habitually cruised in the vicinity of the Caroline Islands for sperm whales, going north in spring. It passed the Bonins and along the coast of Japan, to the Sea of Ochotsk, where it cruised for right whale. Thence it proceeded to Behring Strait and the Arctic Ocean. On its return, it refreshed at the Sandwich Islands, generally arriving there in October or November. The plan adopted for the Shenandoah was to leave the meridian of the Cape of Good Hope about the 1st of January for Australia, arriving about the middle of February; thence after a short stay, to proceed north through the Carolines; and after spending some time in the route of the China-bound clippers, to enter the Ochotsk, and make the round of Behring Strait. Upon her return, she was to take up a position a little to the northward of the Sandwich Islands, to intercept such of the flee' as might have escaped. This elaborate plan was devised by Commander Brooke at Richmond, and was the direct result of that officer's experience in 1855, when serving with the North Pacific Exploring Expedition. It was sent by the Confederate Secretary of the Navy to Bullock, who had recently obtained control of the Shenandoah, and who was considering what disposition should be made of her. Bullock immediately acted upon it. As the commerce of the United States had been thinned out in the cruising grounds of the Alabama and the other commerce-destroyers, it was desirable to seek a new field of operations; and the Richmond plan seemed to answer the purpose. In pursuance of this plan, after cruising for three months in the Atlantic, and taking several prizes, the Shenandoah proceeded to Tristan d'Acunha, where the crews of the captured vessels were landed. From this point she went to Melbourne, where she remained nearly a month. She was allowed to make extensive repairs in her machinery, or at least, repairs that took a considerable time, and she took on board three hundred tons of coal from a vessel sent from Liverpool for the purpose. Having left Madeira short of her complement, she enlisted forty-three men at Melbourne, who were taken on board as the vessel was on the point of sailing. Leaving Melbourne on the 18th of February, 1865, the Shenandoah proceeded under sail to her proposed cruising ground in the neighborhood of Behring Strait. Here she captured and burned a large number of whalers. The capture and destruction of prizes was continued until the 28th of June, when it came to an end, on account of information received by Waddell, that the Confederate Government had ceased to exist. Waddell then brought his vessel to Liver pool, and surrendered her to the British Government. Note of interest: As described above, the Shenandoah wiped out most of the New Bedford whaling fleet off the coast of Alaska, taking many prizes and more than 1,000 prisoners. It is appropriate, therefore, that the Sons of Confederate Veterans Camp #1820 located in Alaska selected "CSS Shenandoah" as its camp name.